Not signed up to PayPal? Want to pay with a credit card? 11 Do You Want Crying? 24 pages of liner notes. Exclusive interviews with Katrina Leskanich and guitarist Kimberley Rew. Deluxe booklet. 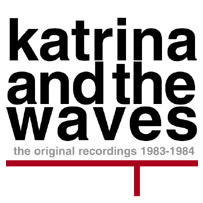 Contains ALL the tracks from the first two Katrina & the Waves albums that were released ONLY IN CANADA on Attic Records in 1983 and 1984. 12 of these songs were re-recorded when the group signed to Capitol, the rest have never been heard again until now. "Their first Canadian album is a masterpiece of guitar pop..."
DVD contains never before seen 1983 concert filmed at Shepperton Film Studios, Photo Gallery, the original "Walking On Sunshine" video + a BRAND NEW 2003 VIDEO for "Dancing Street"
The Katrina & The Waves success story began in Canada where the original version of "Walking On Sunshine" was a minor hit in 1983. Altho based in Cambridge, UK, the group landed their first record deal with the now defunct Attic Records label in Canada which released two highly sought after collectible albums; Walking On Sunshine (1983) and Katrina & The Waves 2 (1984). When the group signed to Capitol-EMI, they re-recorded 12 of the songs for their major label debut, & these two Canada-only lps were quietly deleted and never heard again... until now! To celebrate the 20th Anniversary of these original recordings, the group is re-united with Ralph Alfonso, the man who originally signed them, to re-release these lost recordings in a deluxe limited edition package. A BONGOBEAT EXCLUSIVE CD! Produced by Pat Collier (Vibrators, Soft Boys). THIS IS GUITAR DRIVEN R&B ROCK N ROLL. PLAY LOUD.